“I’d spent more than two decades in the FBI, including fifteen years negotiating hostage situations from New York to the Philippines and the Middle East and I was on top of my game. At any given time, there are ten thousand FBI agents in the Bureau, but only one lead international kidnapping negotiator. That was me. “But I’d never experienced a hostage situation so tense, so personal. So begins Chris Voss’ thriller, Never Split the Difference. Hailed as “gripping”, “game-changing” and “indispensable”, it is so powerful, and so well staged, that at first it is hard to recognize it for what it truly is: a meticulously laid-out guide into the heart and art of high stakes negotiation: with kidnappers, with storefront hostage-takers, with boardroom CEOs, or with toddlers who don’t want to pick up their toys. Voss has the street creds to back up his claim to expertise: from beat cop in Kansas City to the FBI’s lead international kidnapping negotiator, he has participated in thousands of situations, including the one above. Which, by the way, took place at the Harvard School of Negotiation. 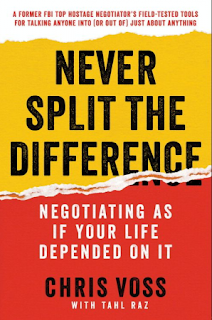 After reading the first fifty pages of Never Split the Difference, however, I wanted to throw the book out the window. There is so much here: every paragraph has something worth remembering or some phrase that succinctly captures the whole meaning. It gives you the sense of leaving something essential out as you pick and choose what to write about. I personally believe that Voss has made at least one reviewer’s life unnecessarily difficult. This book is truly a page-turner. But the content is so pragmatic, so carefully crafted, and so solidly structured, that you come away with an understanding of what an entire well done negotiation looks like. The whole package. It is a book that is worth studying to really get its depth and detail. The chapters are carefully layered, with each building on the skills emphasized in the previous one, so that when you have finished the book (which shouldn’t be difficult since it is hard to put down), you also have a complete picture of the whole negotiation process. 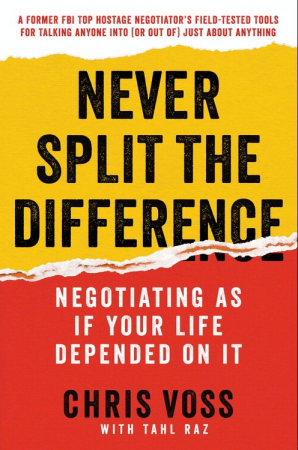 There is this advice for people who believe that negotiation is a “battle of arguments:” Forget all that, forget “prioritizing your argument” before going into the negotiation. Instead, “make your sole and encompassing focus the other person and what they have to say.” Be aware and alert to what is happening in the present moment; be flexible enough to change your approach as you pick up new and previously unknown information. This turns the old adversarial style negotiation on its head. By listening, you “create a safe space where a real conversation can begin.” People disclose more when they are comfortable and are more apt to disclose something previously unknown to you, but which dramatically affects the negotiation. The more they talk, the more information you get and the more information you have, the more power you have. But this is not power in the manipulative sense. It is the power to turn an adversarial situation into a conversation. And this, Voss says, is where a successful negotiation begins. It is based on an understanding of the human psyche: decisions are not made rationally. In his very first chapter, Voss refers to the work of Daniel Kahneman, who wrote that people have two thought systems: the animal one, that is emotional, quick, and instinctive; and a second one that is logical, deliberative and slow. Emotion almost always wins; in fact “it guides and steers our rational thought”, says Voss. Because we are an irrational and emotion-driven species (as one psychologist put it, “We do what we want and make up the reasons for it later), then that is the field in which the skilled negotiator works. Voss emphasizes that “…being right isn’t the key to a successful negotiation; having the right mindset is”. And that mindset is focusing on getting inside the other person’s head, and being flexible enough to use new approaches as new information comes in. The language of negotiation is primarily [italics mine] a language of conversation and rapport. Negotiation is not an act of battle; it’s a process of discovery. Empathy has often been called weak or soft; Voss makes it a warrior’s strategy by teaching tactical empathy …. “Emotional intelligence on steroids”. “The whole concept, which you learn as the centerpiece of this book, is called Tactical Empathy. This is listening as a martial art, balancing the subtle behaviors of emotional intelligence and the assertive skills of influence, to gain access to the mind of another person. Contrary to popular opinion, listening is not a passive activity. It is the most active thing you can do”. Voss is not the first to advocate this. Jerusalem-based international hostage negotiator Michael Tsur advocates steps that give the party a safe and relaxed feeling of being in control, even extending, he says to offering to fly to his office instead of meeting at yours or on neutral ground. He believes, like Voss, that negotiation is not an argument; it is a conversation, a discovery of who this other really is, not just his stated needs and wants but his beliefs about himself and what his life’s “religion” is about. These things are uncovered in empathetic, relaxed conversations. All this wisdom, and I haven’t even touched on calibrated questions; or how “no” is essential to the beginning of a good negotiation; or the two magic words for career success; or the question that is an almost sure-fire tool in successful negotiating; or how dropping your voice at the end of a core question can make all the difference. “Try it and see,” he says. The final chapter, “Find the Black Swan,” refers to the unknown unknowns. Voss draws this from a time when people thought that swans were simply white because that’s what a swan was, the way cardinals are red. One day, an explorer spotted a black one. It was an entirely new element: no one could have imagined it, and it changed their paradigm. Voss’ Black Swan is that element that you may not know is there but that can have a game-changing effect on a negotiation. This is an elegant chapter, still having the thriller sense but underscoring how profoundly tactical empathy can lead to a discovery of great consequence. The story of Dwight Watson is the story of a black swan. A North Carolina farmer protesting government cutbacks of tobacco farmer subsidies, Dwight Watson brought his tractor to D.C. and drove it straight into the memorial pond between the Washington monument and the Vietnam Veterans Memorial, threatening to blow up the entire area. For two days, in spite of the negotiators’ best efforts, Watson refused to come out. From Voss: “In any negotiation, but especially in a tense one like this, it’s not how well you speak but how well you listen. Understanding the ‘other’ is a precondition to be able to speak persuasively and develop options that resonate for them.” In this case, the listening uncovered two heretofore unknowns. One was that Watson was a veteran and lived by a certain code of conduct. He would surrender, if it was done with honor…but not right away. But time was not on his side. He had been there two days, the snipers were edgy, the city was on full alert, and the situation was becoming increasingly problematic, as were Watson’s chances of coming out alive. Then came the Black Swan. A team member listening closely to Watson for clues in his speech came to realize that he was a devout Christian. “Tell him that tomorrow is the Dawn of the Third Day,” she said [the day that Christians believe Christ ascended into heaven]. If Christ came out on the Dawn of the Third Day, then why not Watson? These two together comprised the core of Watson’s worldview and was brought about by deep listening. Watson kept faith with the most important beliefs in his life when he surrendered. Tactical empathy is the lesson of this book and Voss demonstrates its value, shows us how to comprehend this at a deep level, and how to achieve it … in a hundred different ways. Voss and his co-author Tahl Raz have created a brilliant book, worth reading again and again. You don’t have to read it, but if you don’t, you may find yourself at a disadvantage.